West Virginia takes a statewide pause today to commemorate the passing of our greatest advocate. 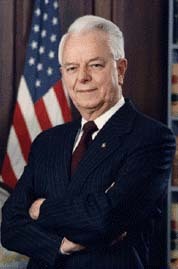 Senator Byrd dedicated his career and life towards making this great state a better place for each and every citizen. For 52 years he fought for us — my mother’s whole life (not to mention my own). Both economically and socially, he always ensured West Virginia would not be forgotten. Senator Byrd was loved by all West Virginians, regardless of status or standpoint. His passing leaves a great void in the soul of this state, but his memory will live on for generations, in the hearts & minds of all those whose lives his good works touched. My condolences to the entire Byrd family — my heart goes out to you as I know his went out to all of us.